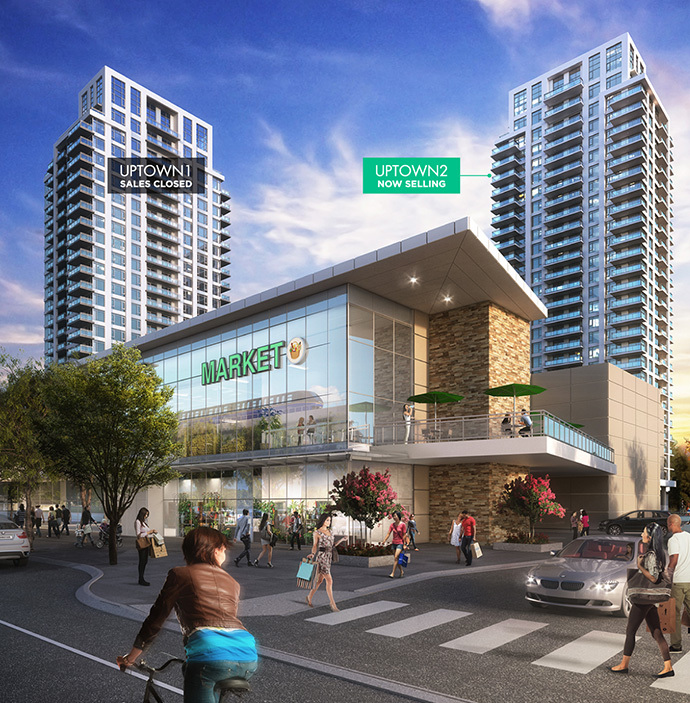 The second phase of the Uptown Coquitlam real estate development by Bosa Properties is coming soon to the market place! Uptown 2 Condo high-rise will be situated at 581 Clarke Road Coquitlam and will feature an exceptional location just steps away from the upcoming Evergreen SkyTrain line and diverse new retail space plus easy access to SFU, Highway 1 and recreational activities on the North Shore. In addition, the location is very vibrant and urban with affordable condos coming soon in late September. If you are a home buyer wanting more out of your new home and living experience, the Bosa Uptown2 Coquitlam condos will provide you just that! As part of a master planned community, this neighbourhood will feature 2 towers with a total of 450 residences. 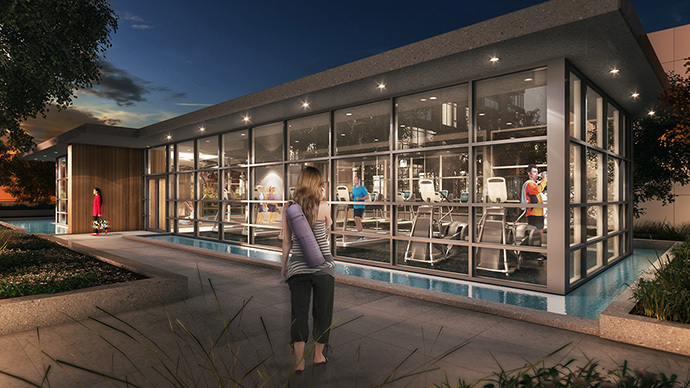 Uptown2 Coquitlam will have it’s own private, stylish entertainment lounge, and the community will also feature a complete Wellness Centre Pavilion complete with a fitness gym, change rooms, yoga studio, infrared sauna and steam room. As far as local amenities are concerned, the community’s base with feature a new Starbucks and new Safeway and the new presale Coquitlam Uptown2 Condo high-rise will be just minutes away from Lougheed Town Centre where you will find plenty of stores, big box retailers, London Drugs, H&M, Walmart and The Bay. As mentioned above, the Uptown Coquitlam master planned community by Bosa Developers is also just steps away from the new Burquitlam SkyTrain Station along the new Evergreen Line that is already under construction. From Burnaby Mountain to Como Lake and from The Vancouver Golf Club to numerous parks, the Uptown2 Coquitlam condos for sale are within reach to everything you want to see and do. Simon Fraser University is also nearby. The new Coquitlam Uptown 2 condos are accepting priority registrations online at www.bosaproperties.com. The architecture is by NSDA Architects and BYU Design is the professional team behind the interior features and finishes. 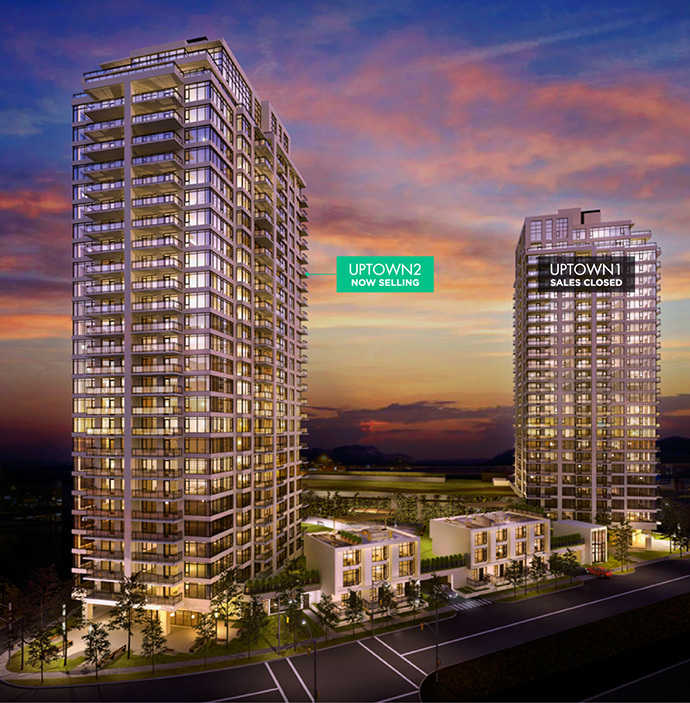 The new Uptown2 Sales Centre is located at 581 Clarke Road Coquitlam BC where you will find more information about the new high-rise floor plans, price points, and new designer display home. The Bosa Properties Early Buyers Bonus will give you an incentive of $4,000 off one bedroom homes and $7,000 off two bedroom homes for the first 100 homes sold at Uptown2 Coquitlam. This second phase will feature 1 bed, 1 bed+den, two and three bedroom floor plans. Construction is expected to be completed by the end of 2016. From their email desk: PHASE 2 at Uptown Coquitlam by Bosa – GET IN FIRST! REGISTER TODAY. We’ve had an incredibly successful Sales Program at Uptown’s first landmark tower over the last six months. Our first tower was snapped up so quickly – well loved for its upscale features and desirable location, Uptown1 Coquitlam high-rise is over 85% sold! As a Bosa Insider, we want you to be among the first to know about the release of our next phase. The new presale Coquitlam Uptown2 condos feature luxury amenities, spectacular views, ground floor grocery, parks, and shopping – all mere steps from the new Burquitlam SkyTrain station on the Evergreen line. The doors to our new sales centre and designer model home will soon open for VIP previews, and we’d like you to be a part of it. Over the coming weeks we’ll have more information to share, and we are very much looking forward to speaking with you. To ensure that you receive the most up-to-date information, please register here. Of course, we can be reached anytime at the number below. PHASE 2 COMING SOON. 1, 1 + DEN, 2 AND 3 BED HOMES AVAILABLE. The Uptown Condos are located in West Coquitlam (also known as Burquitlam community). The interiors are designed by BYU Design Group and will feature contemporary (but not cold or minimalist) finishes. From rich marble counters to the use of elegant and luxurious materials, Uptown 2 Coquitlam condos will feel warm and traditional but still very modern. The kitchens will have large prep areas that are functional and the wood grain integrated kitchens will add that touch of modernism that home buyers seek. The master bedrooms will be extra spacious and the ensuite bathrooms will be spa inspired. Live close to shops, restaurants/cafes, major transit routes, the Burquitlam SkyTrain Station, Simon Fraser University and many parks and recreational facilities today! Coming this Fall 2014 to the Coquitlam real estate market place is Phase 2 Uptown condo high-rise brought to you by leading developer Bosa Properties. Here, you will find high-rise residences between 1 to 3 bedrooms with spacious and functional layouts. The first tower sold out in no time, so the Phase 2 Uptown2 Coquitlam condos are expected to sell out quickly too! The West Coquitlam neighbourhood is a prime location for an urban transformation and Bosa Properties has undertaken this enormous task with ease. The next rapid transit community in the Lower Mainland will be right here in Burquitlam and the centre of it all with feature these 2 high-rise towers at Uptown Coquitlam Condos. The master planned neighbourhood is actually a mixed use development, with a large chain grocery store (probably Safeway) and coffee shop (Starbucks) moving into the community as well as a large Wellness Pavilion on site for resident use. 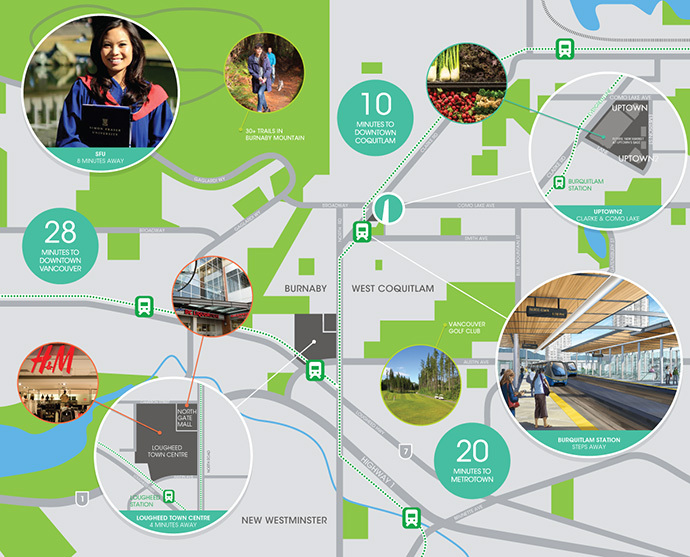 Within steps to the Burquitlam SkyTrain Station (already under construction) and minutes from SFU and Lougheed Town Centre, the central Coquitlam Uptown2 Condos will be ideally situated close to everything. This transit oriented community will also be very pedestrian and family friendly. Within minutes of your front door, residents at Uptown2 Coquitlam condos will find neighbourhood amenities, shops, grocers, banks, services, schools, Burquitlam Park and a recreation centre. The first tower introduced 216 homes which are now sold out. Uptown2 Condos number only 235 residences and select 1 bedroom floor plans will feature the much acclaimed BosaSPACE, a world first interior architecture design that lets home owners transform their space with movable furniture built into the suite. From their marketing web site: Upscale Arrival > Come Home to High Style! A large, clear-view fireplace and custom-designed chandelier suspended from the double-height ceiling. A concierge to receive packages and greet your guests. First impressions count for a lot. Find your balance at Uptown. Embrace a healthy lifestyle in the fitness room, yoga studio, infrared sauna, and steamroom. Then unwind with friends or cheer for your team in the entertainment lounge. Work + Play in your 2,315 sq.ft. Private Wellness Pavilion at Uptown Coquitlam! Live with balance. Adopt a healthy routine in Uptown’s fitness room, yoga studio, infrared sauna, and steamroom. Then unwind or get social in the entertainment lounge. Live it UP. A major-chain grocer is at the base of the Uptown towers and Lougheed Town Centre is only minutes by car or SkyTrain, or a 25-minute walk. Craving Korean BBQ? Some of Metro Vancouver’s best kept secrets are nearby at Lougheed and North Road. Park your electric car in a parking stall supplied with a charging station—your battery will always be charged and ready to go. BosaVOLT™ is a first in North America and just another example of Bosa’s progressive thinking.